From year to year, the Franchise 500® has mirrored business and societal trends throughout the U.S., Canada and beyond. New franchise categories rise up -- sometimes suddenly -- while familiar brands sometimes lose a little luster. For example, take the dominant sector in our list, Food/Quick Service. Last year it represented 20.8 percent of our rankings. This year it has shrunk to 19.2 percent. Yes, that is a small drop, and yes, the category still accounts for 177,922 units worldwide. But it’s a slide that’s indicative of changing tastes among consumers. Fast-casual concepts and the push for fresher ingredients -- the “Chipotle” model, if you will -- have garnered an outsized buzz and customer base in the last couple of years. But this tilt also represents an opportunity for established franchisors to fight back by adding a twist to their strengths, namely efficiency and cost. Exhibit A: this year’s number one franchise, Jimmy John’s Gourment Sandwiches, which built its model around straightforward sandwiches and delivery. The contradiction of novel concepts taking off and nimble established players holding their position speaks to the unique nature of franchising. Depending on a franchisee’s level of risk, he or she can play it safe or be part of the next big thing -- both ends of the spectrum make up the Franchise 500®. The takeaway? A well-run franchise works no matter what it sells or services it offers. So where’s the growth? 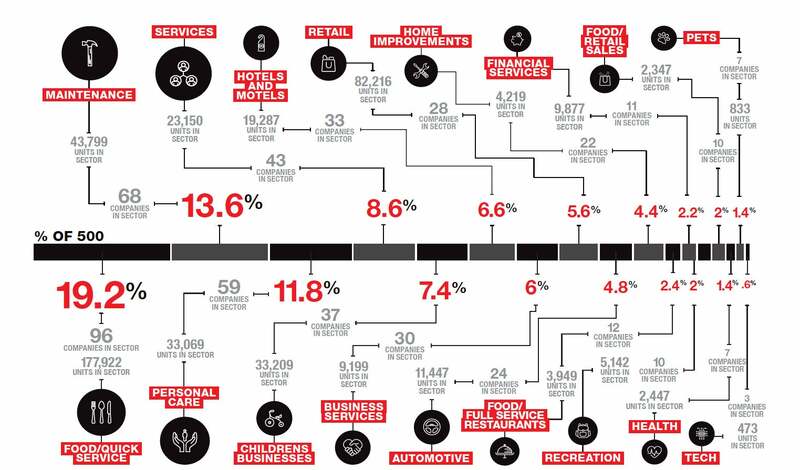 By this year’s rankings, it is in the Maintenance and Hotels and Motels sectors, followed by Home Improvement. Read on to learn why. Historically, this sector has been one of the top performers in the Franchise 500® thanks to its low cost of entry for new franchisees. That has led to a flood of new businesses geared toward commercial cleaning services, all of them fighting for what may be perceived as a static pool of customers. However, over the last couple of years, the sector has evolved into more concepts focused on residential cleaning and restoration services. Helping matters is a rising pattern of dramatic and destructive weather across the country, which means big business for franchisors and franchisees prepared to spring into action. But Maintenance is also home to the most unusual franchisor we saw this year, Spaulding Decon, a biohazard-cleanup specialist with a proprietary method for dealing with, of all things, meth labs. The company didn’t crack the rankings, but we highlighted them anyway, as an example of the type innovation possible in mopping up other people’s messes. At the opposite extreme on the affordability index from Maintenance sits the lodging business, the second fastest-growing sector in our rankings. With costs for some franchises, such as Hilton Hotels, reaching into the tens of millions of dollars, it’s not a business for the faint of heart when it comes to raising capital to buy in. But buy they do, and with sound economics and stellar corporate oversight, even in the face of competition from the likes of home-sharing services such as Airbnb, it’s easy to see why. Hampton Inn, which held the top spot last year, fell all the way to, ahem, two this year. Unfortunately, a rebranding and repositioning by new owner Hilton means that this is the last year this franchise all-star appears on our list. They’ll be missed. With home prices finally blowing past their Great Recession trough in most of the country, it’s no surprise that people are willing to spend on their houses again. And franchisors are there to serve them in increasing numbers. From kitchen and bath remodeling to window and floor treatments, the sector, like Maintenance, grew as people began to see their residential property as investments worth taking care of instead of as money pits. If home prices stay on their current upward trajectory, expect more growth to come. We broke down the Franchise 500® by total number of companies in each category, total number of individual franchise units and percentage that each sector claimed in this year’s rankings.